A little positivity goes a long way. So, along with a team of other young people, I took part in a Good Gestures Day. It involved us offering members of the public high-fives, hugs, handshakes and fist bumps – all just to brighten their moods. Groups in a number of other cities are also held their own Good Gestures Days to make this a national event. The original day, that’s led to this bigger campaign, was held in Birmingham last November. I wasn’t able to attend, but Stephen Sutton, who inspired the project, asked me to get involved this time. I’m currently studying at university in Manchester, but Stephen’s been a close friend of mine since secondary school. Despite being diagnosed with incurable cancer in 2012, he didn’t let it stop him from having a laugh. He was a gifted individual and always chose to live life to the fullest. It’s an honour for us to be part of this campaign and to spread Stephen’s message to the streets of Manchester. Our National Good Gestures Day event was held in Market Street/Piccadilly Gardens in Manchester on Saturday 10th May. Click here to find out more about National Good Gestures Day 2014. The day was a great success! 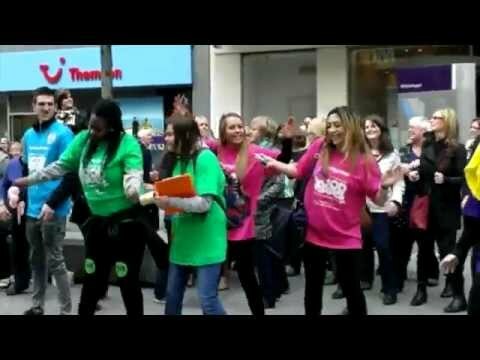 Loads of people on Market Street got involved to spread positivity and we had loads of singing and dancing moments! People really cottoned on to the spirit of the day and word about what we were doing spread really well. The Fixers in Manchester gave out hugs, high-fives, fistbumps and handshakes. A story about our campaign and event was featured in the Manchester Evening Post. Click the image below to view.